Is there anything more romantic than strolling hand in hand on a pink sandy beach? 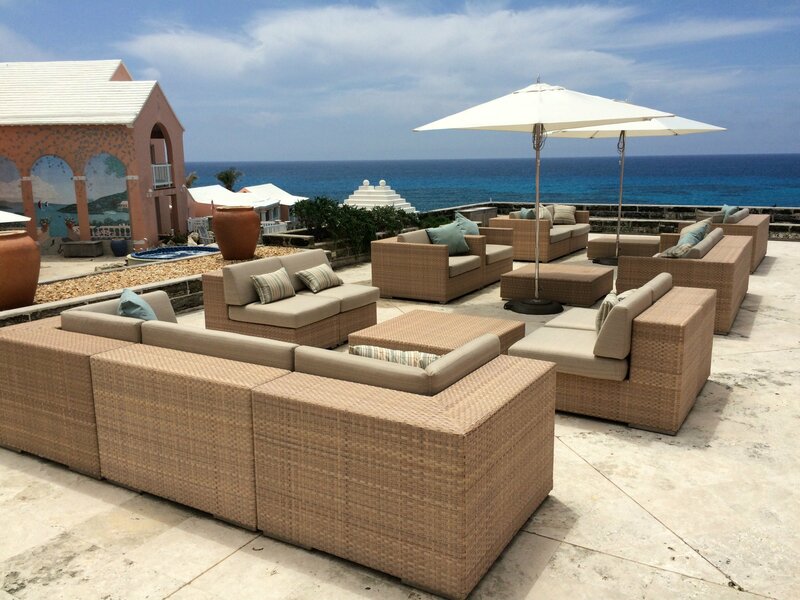 Or looking out over the turquoise blue water as you sip a cold drink while a little paper umbrella bobs on top? 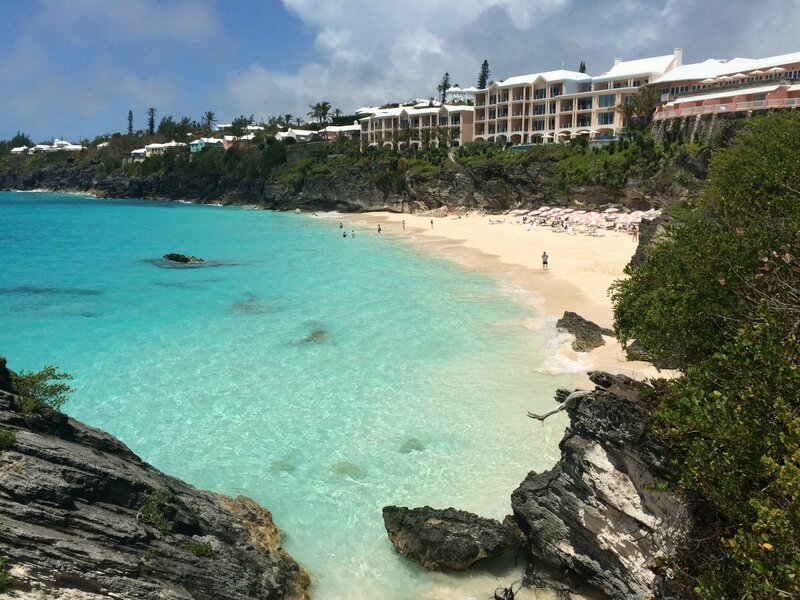 This is what drew us to Bermuda to celebrate our fifth wedding anniversary. It was a such an easy hour and a half flight from Boston. Our flight was at 8:00 AM and we were sitting on the beach by noon. 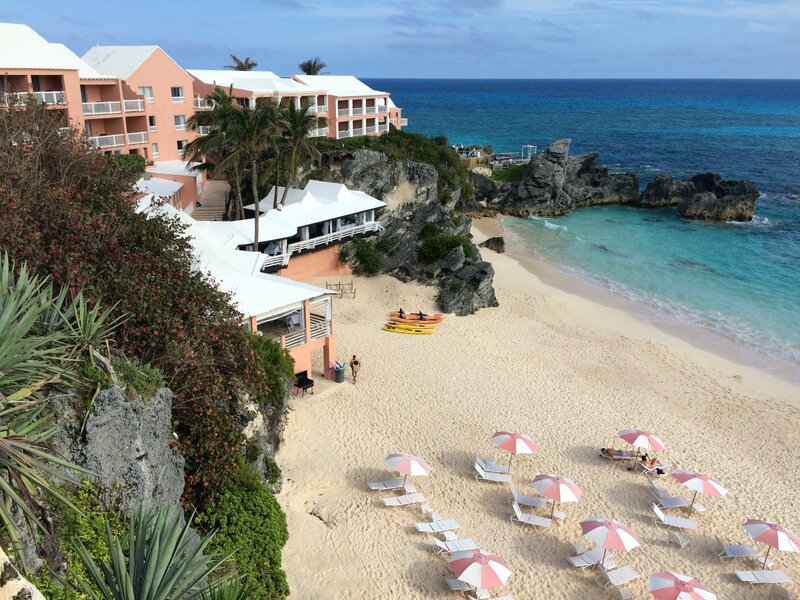 I studied all of the resorts on Bermuda and fell for The Reefs for many reasons. 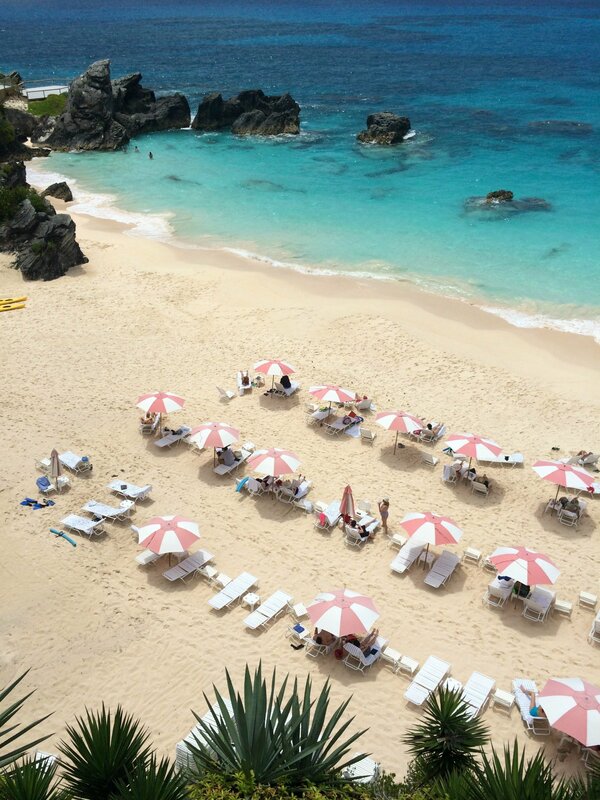 As funny as it sounds, it is hard to find a resort in Bermuda that is on the beach. 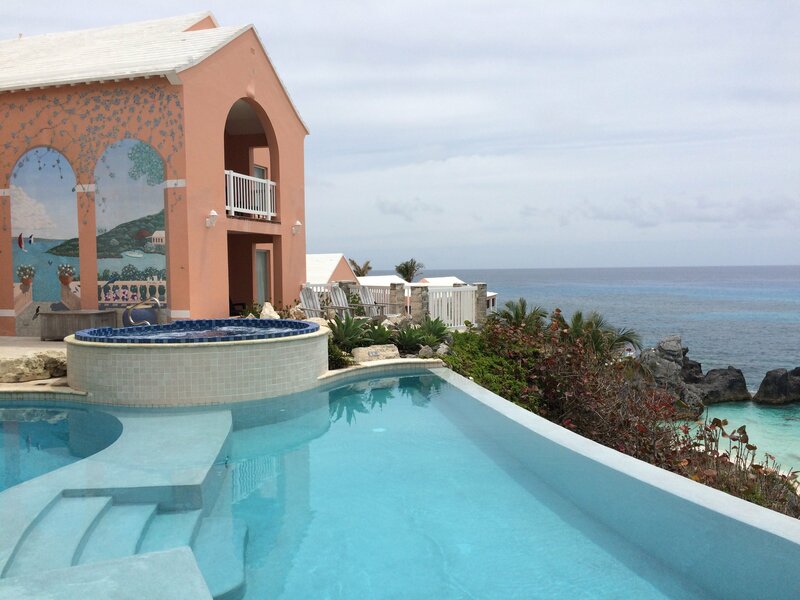 The Reefs is perched on a cliff-side overlooking the ocean. A short walk down a winding trail will bring you to their very own private beach. It is a perfect little crescent shaped beach that nature carved out of the cliffs. There are some resorts that ruin you from traveling, because nothing will ever live up to them. When we were checking in, they had welcome signs for people returning to the resort… “Welcome Back Smith Family, for their 10th visit.” A place has to be very special for people to return year after year. I have stayed at two properties that have this in common and The Reefs was one of them. Each room has a gorgeous view that looks out over the ocean. I could sit on the terrace all day long. We had breakfast in Aqua Terra each morning which is a formal dining area with large windows that completely open up to the sea. Our favorite place to eat lunch was Coconuts, because it was right on the beach and had a more casual feel. There is live entertainment almost every night. 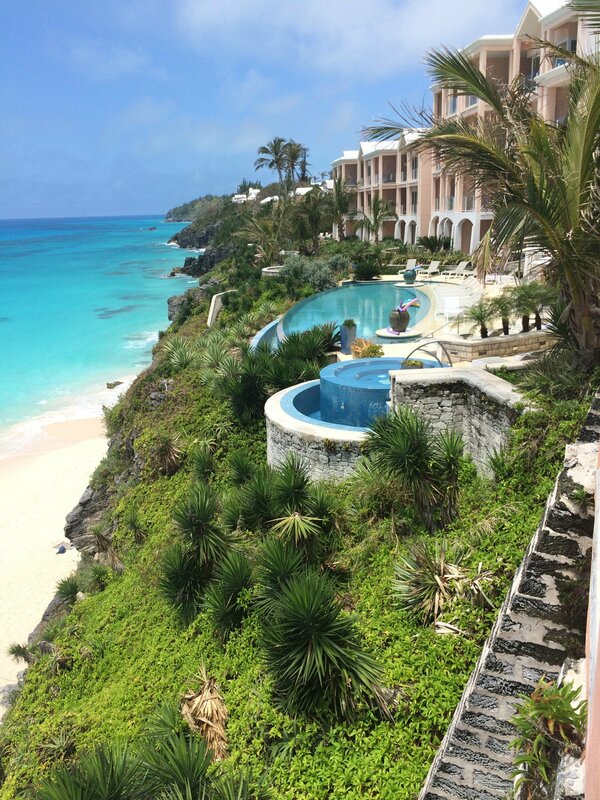 The freshwater infinity pool is on the top of the cliff along side the hot tub, so you can enjoy a panoramic view of the ocean while you relax. There are complimentary paddle boards and kayaks you can use to explore the rock formations. The resort was about a 30 minute drive from the airport. They arranged our airport transfers so that we didn’t have to figure out how to get there. It is located on the southern part of the island, far from the hustle and bustle of the city. There are no skyscrapers or buildings around- just raw nature, limestone cliffs and beautiful beaches. The public transportation was so easy to figure out because there is a bus stop right in front of the resort. 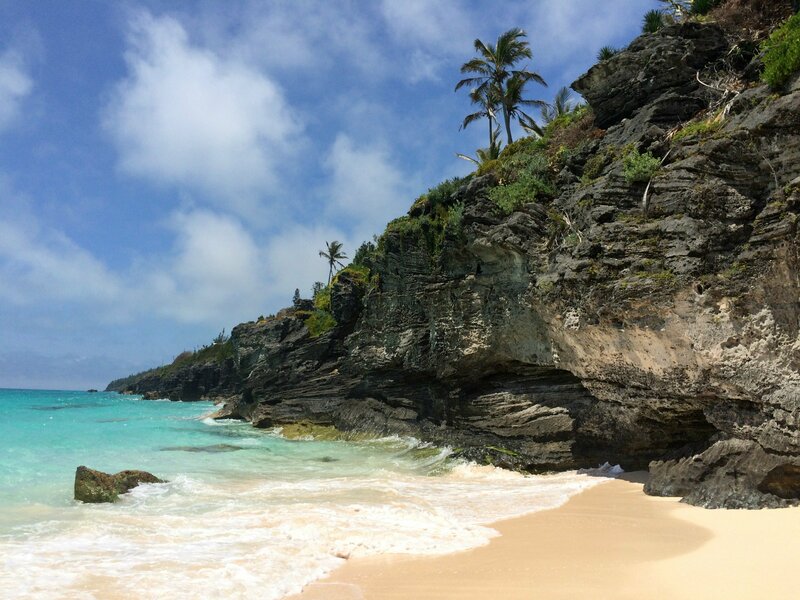 Horseshoe Bay, one of the most beautiful beaches on the island, is just a few stops down the road. Elbow Beach is just 10 minutes down the road. I think it is the most beautiful area on the island, because it is so unspoiled. When we did go into Hamilton, we actually took the bus in the opposite direction down to the Dockyard and hopped on the ferry. It was included in our public transportation pass and we got a nice boat ride out of it! The people in Bermuda are very friendly. Our taxi drivers became travel guides and story tellers. But the concierge at The Reefs really went out of their way to help. They booked all of our dining reservations, activities and transportation. Their honest advice never steered us wrong. My husband was so worried that he wasn’t dressed up enough, so before dinner he kept running up to the girls at the front desk. He would ask them if he was dressed appropriately and the would shake their heads and he would come running back to change. I think it took him three tries before he got the thumbs up. Bermuda is a classy place. One of the places we had dinner would hand men a suit jacket if they weren’t wearing one. Think: pink shorts, knee-high socks and belts with the little whales on them. We struggled in that department with our ripped jeans and flip flops. I loved how incredibly clean and safe the island was. I am used to finding stray animals on these islands and then spending my trip figuring out how to get them someplace safe. There was none of that here. Stray chickens, maybe, but there are no puppies running through traffic. For someone like me that is really sensitive to that kind of thing, it was amazing being able to completely relax. 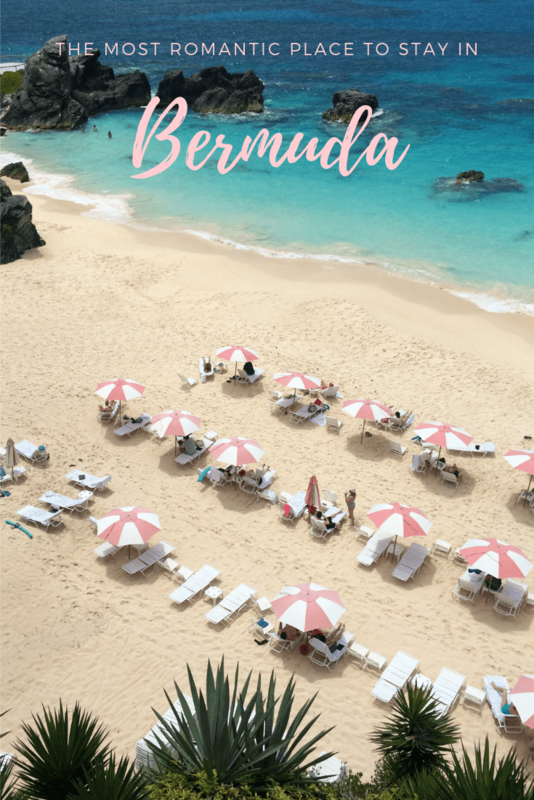 We went to Bermuda for a long weekend and it was the first time we had left our kids. I was so worried about them and thought they would have a hard time managing without us. We FaceTimed them at Grammy’s and they were too busy having fun to even talk to us. I don’t think they even noticed that we were gone. I was so used to getting a solid 4 hour of sleep with the little one but on our first night, we slept 12 hours! I couldn’t believe it. It felt so amazing. It also felt strange to leave the hotel room without carrying a giant diaper bag, sippy cups, snacks, and multiple jackets. I even… get this… held my husband’s hand! Those early years of parenthood are hard and they can really take a toll on your health and relationship. Take time for yourself. Kiss the guilt trip goodbye and go on an adventure with your partner. Trust me, you deserve it! The Reefs is the perfect place to unwind and reconnect.